Be it any festival or ritual, the people celebrate it to the fullest. Your brother in Cuttack so trapped in daily ruckus deserves to smile a little wider. Be the reason of his ceaseless smile by sending Rakhi to Cuttack and letting him know you are always by his side. Cuttack, the former capital and the second largest city in the East Indian state of Odisha is also known as the Silver City. Famous for its unique Filigree works, woven textiles, Bali Yatra, Durga Puja and Dahi Bara Aloo Dum, Cuttack is considered as a Twin to its state capital Bhubaneswar. If your dear brother stays in this city and you are in a different city, you can still send online rakhi to Cuttack from the comfort of your home. Be it any festival or ritual, the people of Cuttack celebrate it to the fullest. And a sacred festival like Raksha Bandhan is very popular in the city. The residents of Cuttack celebrate the festival with fervor and compassion. Therefore, Floweraura being the Messenger of Emotions believes in making the celebration more lively and memorable. 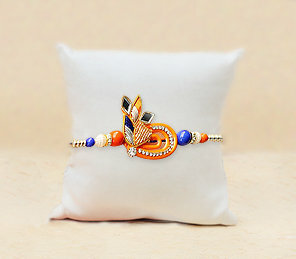 And so, we are here to deliver artistic Rakhi at your doorstep so that you can have an amazing Raksha Bandhan. Yes, with FlowerAura, you can send Rakhi to Cuttack to your brother. When it comes to sending Rakhi and other heart touching gifts to express your love and affection to your little brother, you can easily send kids rakhi online. From chota-bheem rakhi to angry bird rakhi with chocolates, you will always be spoilt with huge range of Rakhi gift options in this online store. Our special silver stones embellished perfectly will suit Cuttack's specialty. Along with it, you can send Roli & tikka set to your brother as well. If your brother stays alone in Cuttack and you are willing to surprise him then this is the perfect way. And even if you forget this auspicious day then our Express Rakhi Delivery to Cuttack is the perfect way to gift a Rakhi on the same day. By ordering through our "Express Rakhi" feature you can be assured of the delivery of your rakhi on the same day without any hassle. Rakhi is the best time to make your brother feel special and with Floweraura surprising your dear sibling is easier and special. Even if you are far away he'll definitely feel your presence in Cuttack. If you are staying in a different country, you can still make your brother feel extremely delighted by sending Rakhi online in India.